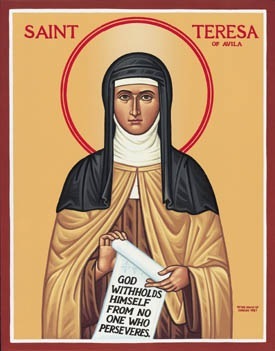 The Church commemorates St. Teresa of Avila, also called St. Teresa of Jesus. There is a lot written about this Spanish mystic in other areas of the internet so I won’t bother with history here. What has always drawn me to this historical religious figure is the unwavering devotion to God that she portrayed. She was a prolific writer and several of the poems, prayers and quotes attributed to her have been the basis of hymns that the church still sings today. If you’ve ever heard it sung as a Taizé chant you will know what I mean.